What do you pay? 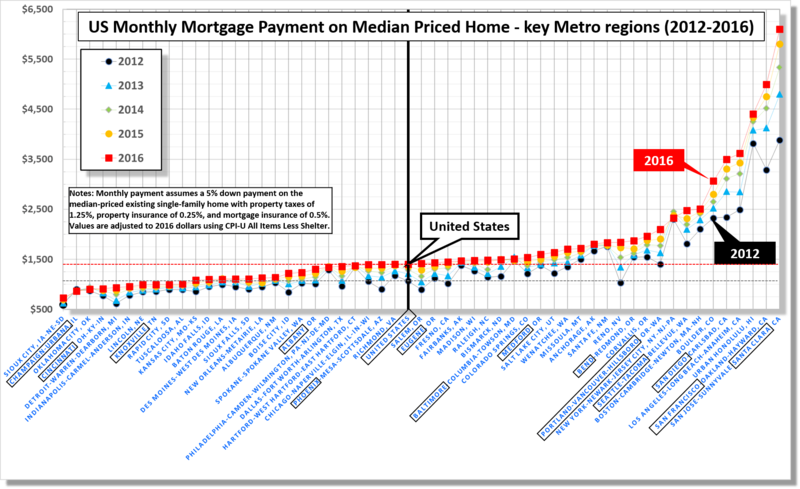 Monthly mortgage payment for a median priced home across key US metro regions. There is a huge variation from small university towns (Urbana-Champaign at $863) to Silicon valley (San Jose metro at $6102). The median US mortgage payment has increased from $1069 in 2012 to $1405 in 2016, almost 30% increase, due to price increase and rising interest rates. California has seen a steep rise, with San Jose/Sunnyvale/Santa Clara region rising by 60% (from $3785 to $6102). Click to enlarge. Source: Joint Center for Housing Studies at Harvard University. Raw data for multiple house matrices are available here.